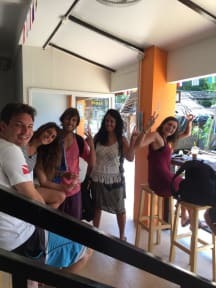 Voyagers Hostel i Koh Phi Phi, Thailand : Boka nu! Great place. Awesome lady in the reception, so sweet and caring. Very clean. Chill atmosphere. Can book any tour or ferry through the hostel. Will stay again if I get back to koh phiphi. Good place if you're more of a mellow traveler but still likes to socialize abit. I had a great stay for two nights, the hostel is just two big rooms with beds, ac and shower/toilets but it’s actually all you need on the Island, great location and the staff was so friendly and helpful. You don’t live inside the party but it’s just a few meters away! Only negative was the beds which were so hard but otherwise I would really recommend it. We thought it was a gray hostel, stayed for 2 days. Only thing it was quite expensive compared to other hostels but definitely worth it! A very small hostel with very nice staff. A bit of a walk from the pier, but still the location was great. Close to the beach and all the partying but still quiet at night. The downside was the not so nice bathrooms, but overall it was a good place for a shorter stay.